This last Friday was marked as one of the greatest days in the history of South Africa. It was the opening of the 2010 Soccer World Cup. 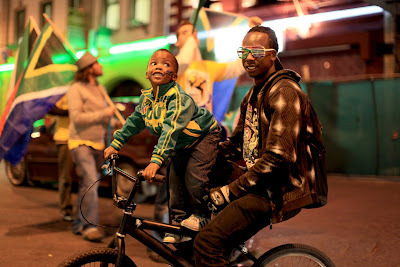 In the late afternoon when the whole country, and much of the world, was fixed on a TV screen, or at one of the local fan parks, or even at the game, watching South Africa play Mexico in the opening match I was on my bike, happily riding the teeming streets of Cape Town looking for that one special fan on his bicycle. I saw him in minds eye - decked out in his full fan regalia, twin vuvuzelas strapped across his back, sitting up straight on his bike wearing a wide grin across his painted face, every available bit of space on his bike jammed with South African flags, streamers laced through the spokes, lights flashing - the real deal. I never found him… I found someone better. I found Takura Chadoka giving Mango Mogeni a lift on his BMX through the soccer crazed city streets, "...just to feel the vibe that’s all around - it’s cool!" Takura, like me - and little Mango it turns out - care more about bicycles and riding them than we care about soccer, "...it’s a good game, a beautiful game you know - but I like bicycles!" Takura said it best - it's not that we have a problem with soccer, it's just that we know, more than anything, we love our bikes more than we love the World Cup coming to our country. And finding each other in the midst of all that soccer craziness and screaming to be able to hear each other over the cacophonous vuvuzelas just to talk about bikes was awesome. We know who we are. Bicycle Portraits will be a photographic book exploring contemporary South African bicycle commuter culture. Please visit http://kck.st/c09uOF and support us by pledging for a reward on our Kickstarter fundraising initiative page. For a pledge of $50 you are essentially pre-ordering a copy of the book. Please have a look! It's easy! We're 85% funded with only 4 days to go! With your help we can make it!